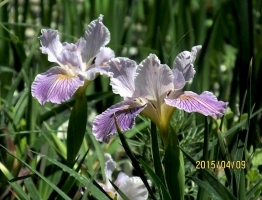 ‘Bonnie Rose’ is one of our pacific coast irises with many vibrant shades of lavender. Believed to be a seedling of ‘Canyon Snow’ either self pollinated or bee crossed. Will grow in part shade by the coast or shade in a more inland area. Mulch to retain moisture and keep cool in the summer- drought tolerant after established. Evergreen -good grower not “challenging”.